Known as the first lady of Indian cinema, Devika Rani ( 1908 – 1994 ), dazzled the screens for almost 10 years in 1930s and 40s. Born to wealthy parents, she studied at a boarding school in England. Married to Himanshu Rai, a film producer, she started working with him and assisted him in costume design and art direction. Himanshu Rai cast Devika Rai as a heroine in his film "Karma" (1933), in which he himself played the lead role. Himanshu Rai established a production studio "Bombay Talkies". The studio produced several successful films with Devika Rani playing the lead role in many of them. Her on screen pairing with Ashok Kumar became popular. After Himanshu Rai's death in 1940, Devika Rani produced few more films but took retirement from film industry in 1945. 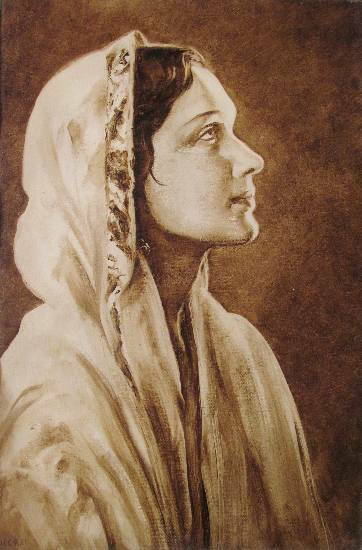 She married Svetoslav Roerich, a Russian painter (son of famous painter Nicholas Roerich), and moved to his estate in Bangalore, to lead a very reclusive life thereafter. Devika Rani was honoured with Padma Shri (1958), Dadasaheb Phalke Award (1970) and Soviet Land Nehru Award (1990).